Nicola Witty, a nutritionist at Allen & Page, helps find the best feeds for Sarah's horses. The feeds at Allen & Page are made using natural ingredients so are really nutritional for the horses. Founded by two event riders, ReadySupp know what is important in a horse's diet, as well as what makes them perform to their best. 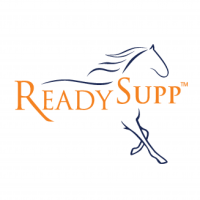 ReadySupp provide an easy way to feed supplements to your horse. Childeric Saddles UK provide beautifully bespoke saddles for both horse and rider. Their experienced and professional team are always on hand to ensure that our saddles are working for both horse and rider, and that they aren't hindering our performance. Andrews Bowen are the world leaders in equine surface technology and installation. They were the official surface supplier at the London 2012 Olympic Games and they also kindly put down the surface on Sarah's gallops. Ely Eventing Centre is owned and run by Tina Ure, Sarah's mentor and owner. The facilities are fantastic and are available to hire. There is something for everyone at Ely Eventing Centre, from 2ft fences to Intermediate and Advanced level. The products at Protexin Equine Premium range from Gut Balancer to Recover Aid, which are both really important for event horses. Sarah is very lucky to receive support from Protexin because it means that her horses are receiving the best possible products to deal with their work load. EquiConsulting provide business improvement services for the equestrian world. They support Sarah with her marketing and promotion.